As one of five girls in my family, I’ve planned my fair share of weddings—especially the Pinterest-inspired DIY weddings. I’ve coordinated everything from a book-themed barn wedding on a mountaintop to a downtown loft wedding with industrial décor mixed with heirloom family furniture, where guests could only get to the ceremony by taking a freight elevator. 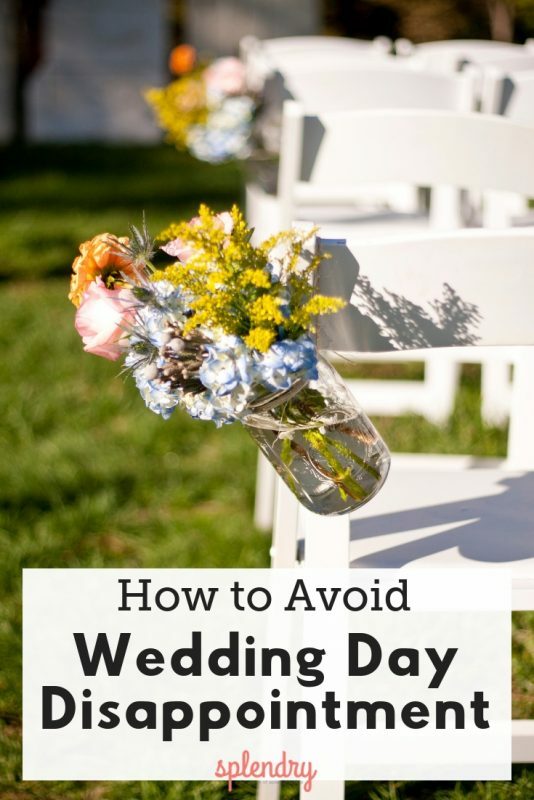 Sufficed to say, I’ve seen a lot of different personalities tackle the task of planning their nuptials and I believe this one step will save every bride, no matter her budget or style, a lot of disappointment on the actual wedding day. Most wedding day disappointments come from unmet expectations. The best way to deal with that disappointment is before it ever happens! Every single bride—and groom (and the extended family members for that matter) comes to the table with preconceived ideas of what a wedding is and what a good one looks like. You might say that you want a small wedding. To your future mother-in-law that might mean cutting the list to 250. Your future husband may say he wants a location wedding. You’re thinking he means that you’ll finally be taking that trip to Scotland you’ve always talked about and he’s really thinking about location of your first date—the baseball field for the local minor league team. The first step in making the wedding day a true reflection of who you are as a couple is to understand that as you begin this process there will be a language difference and pre-conceived ideas you’ll have to navigate through, so don’t let that bother you when you run into it. Don’t automatically give in to someone else’s suggestion because you think that’s what they want. It may be a simple miscommunication. And don’t shut down an idea when you first hear it because it could also be a misunderstanding of what they mean. Hear them out because it may be just the solution you’re looking for! Get a pen and paper or sit down at your computer, grab a coffee, get comfortable, and mentally walk through your wedding day. What does it look like? I don’t mean what type or style of wedding I mean walk through every practical moment of the day. Remember, you’re not writing a plan, you’re just writing down thoughts. Don’t feel any pressure. Walk through your day from the moment you get up to the moment you begin your honeymoon (or the end of your honeymoon, if you like). Here are some highlights and questions to get you started. 1. Where are you waking up? Who is or isn’t with you? Are you at your parent’s house with the home full of siblings and extended relatives? Are you at a nice hotel with your bridal party? Are you alone enjoying a quiet morning? 2. What time are you waking up? Do you see yourself enjoying a leisurely morning or would you prefer to be up early? My younger sister Tessa wanted a lazy morning on her wedding day, but she also wanted Pinterest-worthy wedding décor scattered around the property of the alpaca farm she got married at. We had to set up yard games, vintage books, and a hand-strung photo display, not to mention that we needed time enough for the florists to bring their supplies up the mountain before pre-wedding photos. So, Tessa had to opt for a slightly more intense morning with an hour to relax in between that and the ceremony. 3. Do you have any errands to run before the wedding? 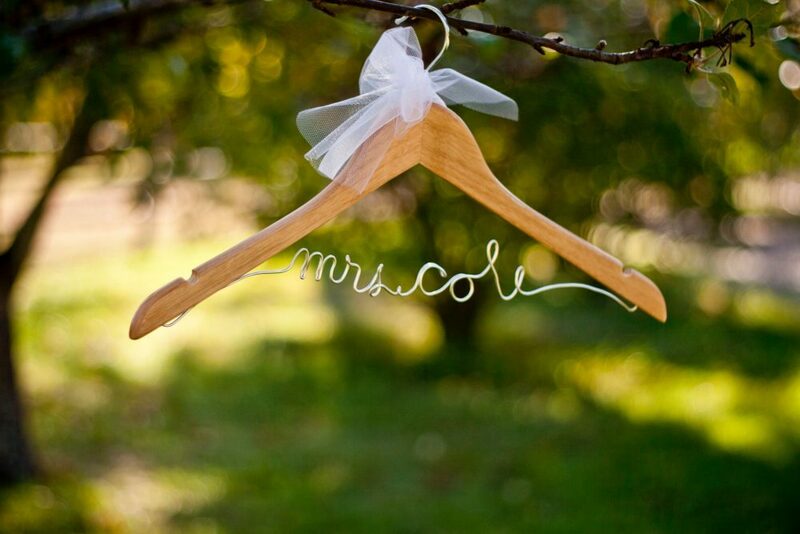 Is your bridal party running errands? My oldest sister Sarah was the guinea pig and all the sisters and our parents spent the day running last minute errands. At one point we had an entire salon folding wedding programs while we got our hair done. Because of that, my sister spent the entire day alone before the evening ceremony and she regretted that no one was there with her. 4. What time of day do you see yourself getting married? Do you see yourself leaving your wedding to a line of sparklers? If so, that means you’re thinking of a nighttime departure. Here’s why this is important. If you’re headed to sunny Hawaii on your honeymoon and no flights leave after 9 p.m., that means you’ll need a hotel room, or you’ll need to stay at your house for the night. If that’s a no-go for you, then you have to decide if the sparkler exit and evening reception is more important than leaving town right after the wedding. 5. Are you inside or outside? What time of year is it? Some of these questions will be determined by the time of year that you get engaged. Do you see yourself in a garden? Are you in a formal cathedral? If a church is the only place you could see yourself married, then you automatically start narrowing down your choices—and avoid wasting time on ceremony options that you wouldn’t choose anyway. 6. Where do you see yourself getting ready? How do you see yourself getting to the ceremony? At first glance, you may think this doesn’t matter, but note what’s in your head because later, you may unknowingly find yourself at odds with your own expectations and not know why. My other sister, Jessica, had wanted to arrive at her ceremony dressed, but we had to be on site for prep work for her loft wedding and it was unrealistic to go back home to dress, so we ended up prepping in the main bathroom area, which also meant we had to be dressed early because guests would need to use that bathroom. These are the odd logistical issues that can turn annoying, but it doesn’t have to end that way. Use prompts like this to determine where your give room is and what you don’t want to compromise on. 7. What are the groom and his party doing during this time? What is your family doing at this time? Think about your family and what would be best for everyone. If you’re having to field questions while trying to focus on getting your makeup and hair done, will you be on edge before starting your new life with your husband? 8. Do you want to see each other before the ceremony or are you definitely against that? Some people prefer to have the first look alone and some prefer to see each other for the first time at the wedding. It’s important to consider what is most meaningful to you because you’ll run into logistical decisions like the fact that if you don’t take photos before the wedding, you’ll miss half of your reception and so on. If you know what’s important to you, these logistical questions will be easier to answer. 9. What are you wearing while you get ready on the day? What does your wedding dress look like? What does the bridal party (including the groom) look like? If you see yourself in an ivory ball gown, but have also always wanted your bridesmaids to wear flip-flops, or your husband-to-be wouldn’t be caught dead in dress pants you’re going to need to make some compromises somewhere eventually. 10. Where is your wedding taking place when you imagine it? Is it a formal setting, a friend’s backyard, or are you on a boat just off the Australian coast? You may be saying right now, “I have no idea.” And if that’s true, just write that, but often I think people are surprised that they do have an image in their mind whether they verbalize it or not. 11. How many people are at your wedding? Think generally. Are there hundreds of people? Are there three? While the bride and groom are the focus of the event, if you have a lot of people at your wedding, you need to understand that the guests will be a big part of the planning. They need adequate food or refreshments, they need enough bathrooms, and the event may need an emcee, no matter how informal. 12. What traditions do you do or not do? This is the most common area where miscommunications can happen. One family may always light a candle, the other family has a tradition of removing the garter. One family may do the dollar dance, and the other doesn’t dance at all. Think about what you see. Are you cutting a cake or do you see donuts and coffee? Often, brides can get caught up in things they feel they have to do because they’ve seen it done, but don’t feel pressured into anything—you’ll still be legally married even if you don’t carry a floral bouquet or have the wedding march. The best traditions are the ones that mean someone, and don’t be afraid to start new ones. 13. When and how do you see yourself leaving the event? Do you see yourself in your wedding dress going back to a hotel room or do you see yourself in a smart travel outfit headed for the airport? Another thing to consider is who is driving you. 14. After the event is over, who does tear down? Who manages to deliver the gifts to the couple’s new home? As a planner for weddings of varying sizes, I know first-hand that there is a lot of logistical work to consider at any wedding, let alone a DIY or crafty wedding. Do you see your family cleaning up? Would you prefer that a professional staff does all that? Weddings are emotional on many levels. The last thing you want your family or friends to remember about the big day is how they got stuck cleaning while you left for your honeymoon. Think through the process and be considerate. Your bridal party will thank you. 15. Lastly, what does your honeymoon look like? Think about your personal habits and preferences. There are often a lot of unspoken expectations here. Think about what is important to you and what will make you feel comfortable and be ready to communicate that to your fiancé. Now that you’ve taken time to consider what you see when you think of your wedding day and what’s important, take this to your significant other. I would encourage you both to do this first step alone so you each have enough time to think through it. Then, when you come together, you’ll know yourself better and be ready to problem-solve more effectively. I can’t recommend this enough. It may take a few hours, but knowing your own expectations instead of waiting for others to read your mind will make the planning process, and the wedding day itself, a great experience for everyone involved! If you’re looking for more wedding planning info, including checklists and budget trackers, we’ve got you covered!